I was diagnosed with Neuroendocrine Cancer in June 2001 at age 49... read on below... and watch the two video testimonials. I was diagnosed with Neuroendocrine Cancer in June 2001 at age 49. The operation revealed, cancer in the head of the pancreas measuring 5.2 x 6cm, cancer in the duodenum, head of the large intestine, a tumor wrapped around the Portal Vein, (main vein to the heart) and 20 Hepatic Metastases in the liver. The Surgeon did not remove any of the tumors, fearing that if they cut them, I would bleed to death. Neuroendocrine Cancer is a rare form of cancer and at the time there wasn’t much information about it nor was there any chemo treatment. I was given 6 months to live and was referred to palliative care. After surgery I became very weak and had low energy because I couldn’t retain anything I ate. I was either vomiting or had diarrhea. I was so weak that I had to crawl up the stairs on all fours and pull myself along the railing to get to my room. I was depressed and felt hopeless and just wanted to crawl into a hole and die. I didn’t want to see or speak to anyone. I asked God: “Why didn’t you take me on the operating table?” I wished I had, instead of living in these awful circumstances, with bloating, vomiting, diarrhea, stinky gas, anemic, weak and always tired. I survived by living on Ensure for 3 months. Along from having cancer, I became a diabetic; from having cancer in the pancreas, high blood pressure, fibromyalgia and osteoporosis. Meanwhile, my social worker at Trillium Hospital kept an eye on me. She called several times encouraging me to go to Wellspring. She said that I will meet other people who are going through the same thing as me. Wellspring is a network of centres that offers support, coping skills and educational programs to cancer patients and their loved ones/care givers at no cost; but I didn’t want to see or speak to anyone. Eventually, I hesitantly called Wellspring and was greeted by a friendly, soft spoken, caring lady, Judy; my 1st Angel. Judy listened to what I had to say. Then she said - I can have a volunteer driver pick you up tomorrow morning and bring you to the centre to speak to a peer support person and you can stay for Visualization and Relaxation. I accepted her offer. At the end of the program, Judy asked me how I liked it. I told her I had a headache because I was concentrating very hard trying to follow along with the visualization. She said she was sorry to hear that I got a headache, but there were other programs that might help me. She suggested the Metastatic Support Group. I thank God everyday for attending that program. While attending the program I met other members that were given, 3 months, 6 months and 1 year to live and they were all living beyond their prognosis. That gave me hope that maybe I could live beyond 6 months as well. They suggested that I ask for a second opinion. I had never heard of that before and that gave me more hope. I hesitated, fearing that my Oncologist would be upset with me, but he wasn't. He referred me to Princess Margaret Hospital where I was told that there was a trial going on at London Cancer Centre in London, Ontario, for neuroendocrine cancer. At this point I became even more hopeful. The doctor from Princess Margaret told my Oncologist at Trillium and he referred me to London Cancer Centre. Princess Margaret Hospital also suggested that I start taking Sandostatin Injections to help with the gas and diarrhea. Within 3 weeks I met with the doctors in London. Meanwhile at Wellspring, I was booked for a Reiki Treatment (energy healing). The Volunteer driver came to pick me up at home but I didn’t remember that I had an appointment. It so happened that the Volunteer was also the Reiki Practitioner - Susan. She decided since she was there already, she would give me the Reiki Treatment at home. The next day, the Reiki made me feel so energized, that I started cleaning the house! I couldn’t believe it. This was amazing! I called Wellspring for another Reiki Treatment. Susan was the Reiki Practitioner again (My 2nd Angel). Susan saw how grey and weak I was and suggested she take me to see her Naturopath as I could not drive myself. The Doctor gave me a vitamin supplement which helped me get stronger. The trial in London consisted of 3 types of chemo plus radioactive treatment (Isotope Idium 111). As a result of the 5 month (7 days a week) of vigorous chemo and radioactive treatment, the cancer in the head of the pancreas shrunk by 10%. I was estatic, grateful and hopeful about the trial the doctor recommended. My platelets had plummeted quite low and the doctor felt it best to stop the chemo for a while, but kept me on a maintenance program of radioactive treatment every 3 months. In 2006 my platelets plummeted again to 29 and no one knew why. The doctors decided to stop the radioactive treatment. I was left in limbo. I decided to seek alternative remedies. I saw a Flyer at Wellspring - An upcoming seminar on Essential Fatty Acids – mentioning that this helped with cancer and other diseases. I called that number and it turned out to be my friend Joey ( Joette Trudeau) was the contact for the seminar. She told me that all her cancer was reversing since she had been on the EFA’s. I couldn’t believe it! Joey took me to Paul’s seminar on EFAs and to my surprise - the meeting was at Susan’s house! It was a pleasant surprise. I started the EFAs and the supplements that were recommended along with the EFAs. The cancer didn't progress nor did the 10 % come back! During treatments and afterwards, I continued going to Wellspring, attending various programs; such as Reiki, Qi-gong (an exercise working with energy and breathing), Tai-chi, Yoga (an exercise program working body mind and spirit in unison). I felt physically, emotionally , mentally and spiritually stronger by attending these programs as well as the help from the support group and psychologist. During the 11 years and 4 months of my cancer journey, I have gained a lot of knowledge and skills from Wellspring, my doctors, Susan (my Reiki Master), and Paul Beatty – his Seminars about EFAs and Cellular Nutrition, The Canadian Cancer Society, the Four Colour Drum Circle, my family and God, who helped me heal myself. The cancer has shrunk by 60%! I no longer have fibromyalgia, my osteoporosis is now classed as osteopenia and my high blood pressure and diabetes are under control. Knowing the benefit of Reiki, I was inspired to become a Reiki Master. I am also a Peer Support Volunteer for Wellspring and The Canadian Cancer Society. 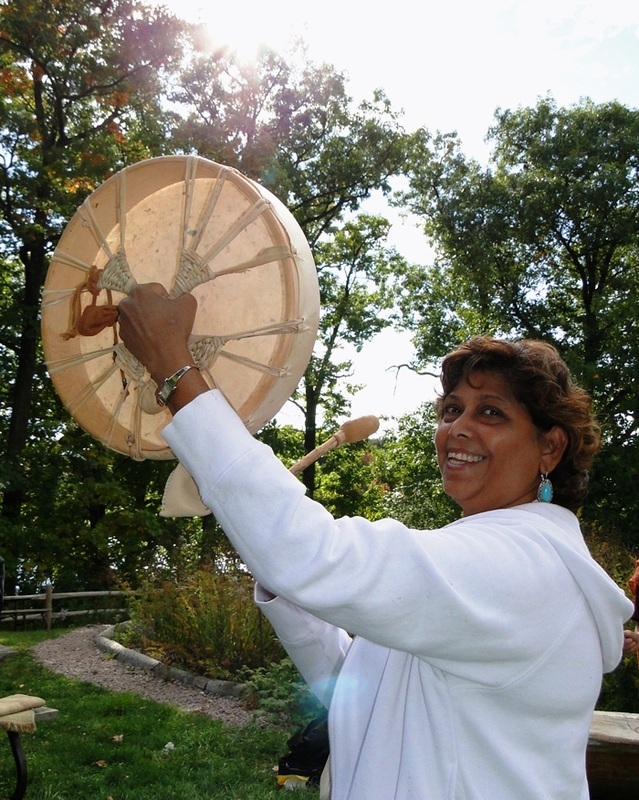 I also attend the Four Colour Drum Circle where I am learning and practicing Aboriginal Healing. I thank God for showing, helping and providing all the means, knowledge, skills, teachers, friends and family that I am still here, living stronger and healthier, recovering with cancer. I am grateful, blessed, honoured and thankful to all the people in my life, which have played a part in my cancer journey.